As we dip further into the fall season, it is a good time to think of changing the colour of your hair! A lot of us make the mistake of assuming it is very easy to dye our own hair. We believe you should get your hair professionally coloured instead! There are so many steps to consider when you’ve made the decision to colour your hair. Sometimes, you forget about the processes involved. How do you prepare your hair? How do you physically dye it? What condition will your hair be in afterwards? What happens if your hair colour does not turn out how you imagined? Luckily for you, we are going to list some reasons why dyeing hair should be left to the professionals. 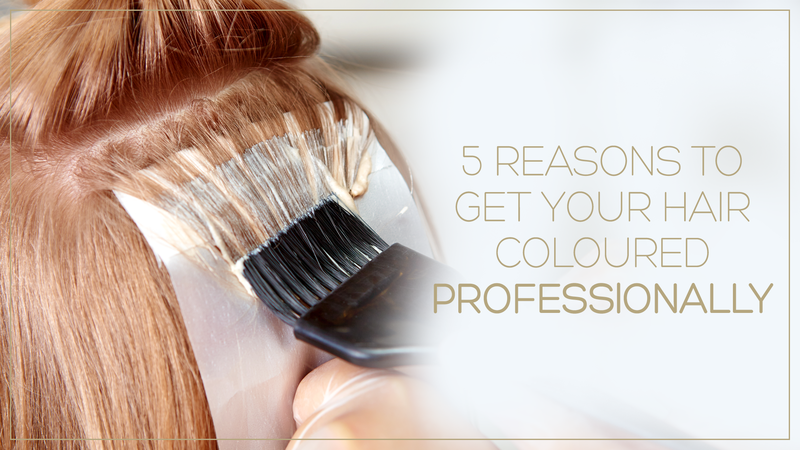 Why You Should Get Your Hair Professionally Coloured Instead of Doing It Yourself. As professionals, our team is trained to achieve the style you are looking for, given the current state of your hair. Through years of training and experience, we understand the best methods to get the best results. The minute you decide to dye your hair yourself, there is a possibility you’ll do more harm than good. If you’re not a trained professional hairstylist, you wouldn’t consider taking scissors to your hair. So why are we so quick to dye our hair ourselves? Dyeing your hair yourself may result in getting your hair professionally coloured anyway. One of the biggest mistakes we see when people use box colour for their hair is they do not know how to dye properly at the root of their hair. “Hot roots” is hairstylist-talk for when roots turn a warmer reddish/orange colour as a result of applying hair colour incorrectly from the roots to the ends. Most people forget that even when just touching up your roots yourself, your roots are your natural colour and therefore a completely different colour from the rest of your dyed hair. When Dyeing Your Own Hair, Remember: DO NOT TRY THIS AT HOME! If you still aren’t completely convinced that you need to get your hair professionally coloured, here are helpful tips to definitely avoid while dyeing your hair in your bathroom sink. With all of this helpful information, we hope to see you for your next hair dyeing experience! Be sure to call Caralyn’s Hair Design to book your next hair consult with one of our professionally trained stylists and FALL in LOVE with your new fun look!